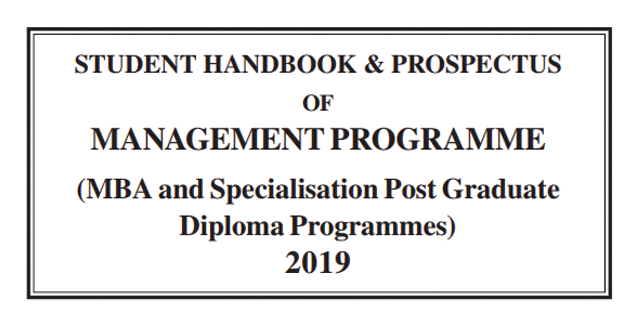 IGNOU releases prospectus for its MBA and other management programs, every year. The latest and current version of the prospectus is for the year 2019. The prospectus contains all the information required for students who wish to do distance learning management programs including MBA from IGNOU. The section below explain how you can download the prospectus or get it by post. If you decide to use the downloaded version, you will have to remit a fee of ₹ 1050 while submitting the application form for entrance test. IGNOU will send you a copy of the Prospectus and Student Handbook after they recive the application form for the entrance exam along with the Demand Draft of ₹ 1050. You can also obtain the Prospectus and Student Handbook from the various Study Centers, Regional Centers and the IGNOU Head Quarters. The prospectus can also be obtained via post if you request for the same along with the Demand Draft of ₹ 1050 drawn in favor of IGNOU payable at New Delhi. The request is to be sent to IGNOU Head Quarters at New Delhi. Given below are the programs covered by the latest MBA prospectus of IGNOU. The prospectus covers all the information regarding the MBA programs and other management programs offered by IGNOU. It has details about the Fee structure, Eligibility Criteria, Syllabus, Program Strucutre, Course Duration and almost everything you need to know about the Management Programs by IGNOU. There are many application forms attached with the prospectus, but for a student who is concerned with the admission for MBA or other programmes, the following are important. The prospectus also contains the formats for the Identity Card, and other application forms and certificates. You can also get the contact details of IGNOU offices and departments from the prospectus.